Today, we decided to do something different; something fun! 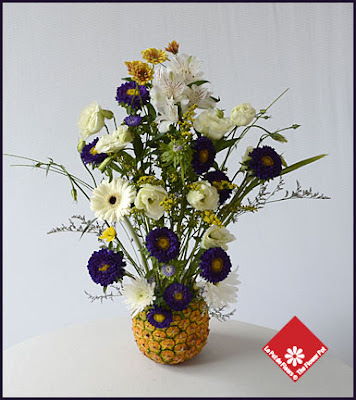 During our daily routine on Pinterest, posting and repining pictures, we came across a floral arrangement that included a pineapple as a vase. We fell in love right away and could not wait to use it as an inspiration. Our floral designer was just as excited as we were when we told her our idea. All we needed was a pineapple, flowers and our beautiful imagination. So, here is our final product. We hope you will love it just as much as we do! It is the perfect arrangement for a summer party.